When cancer starts in the uterus, it is called uterine cancer. The uterus is the pear-shaped organ in a woman’s pelvis. Also called the womb, the uterus is where the baby grows when a woman is pregnant. All women—except those whose uterus was removed by having a hysterectomy—are at risk for uterine cancer, and the risk increases with age. Most uterine cancers are found in women who are going through or have gone through menopause. Each year, approximately 61,800 women in the United States get uterine cancer. Endometrial cancer: The most common type of uterine cancer. Endometrial cancer forms in the lining of the uterus, which is called the endometrium. Uterine sarcoma: A rare type of uterine cancer that forms in the muscle or other tissue of the uterus. When uterine cancer is found early, treatment is most effective. Vaginal discharge or bleeding that is not normal for you. The bleeding may be abnormal because of how heavy it is or when it happens, such as bleeding after you have gone through menopause; bleeding between periods; or any other bleeding that is longer or heavier than is normal for you. Pain or pressure in your pelvis. If you have bleeding that is not normal for you, especially bleeding after menopause, see a doctor right away. If you have pain or pressure in your pelvis or abnormal vaginal discharge for two weeks or longer, see a doctor. These things may be caused by something other than cancer, but the only way to know is to see a doctor. What raises a woman’s chance of getting uterine cancer? Are obese (having an abnormally high, unhealthy amount of body fat). Take estrogen by itself for hormone replacement during menopause. In general, when estrogen is used, it should be in combination with the other female hormone, progesterone. Have had trouble getting pregnant, or have had fewer than five periods in a year at any time in your life before starting menopause. Take tamoxifen, a drug used to prevent or treat certain types of breast cancer. If one or more of these is true for you, it does not mean you will get uterine cancer, but you should talk with a doctor to see if he or she recommends more frequent exams. Women who have an inherited form of colorectal cancer, called hereditary nonpolyposis colorectal cancer syndrome, have an increased risk of getting uterine cancer. This may be true for you if you have close female relatives (i.e., your mother, grandmother, sister, aunt, or daughter) who have had uterine or ovarian cancer. If so, talk to a doctor about having annual exams and endometrial biopsies, starting at age 35. How can I help prevent or lower my chance of getting uterine cancer? Maintaining a healthy weight and being physically active. Taking progesterone, if you are taking estrogen. Talking with a doctor about how often you should be checked for uterine cancer, especially if you think that you have factors that increase your chance of getting it. Are there ways to prevent uterine cancer or find it early? There are no simple and reliable ways to test for uterine cancer in women who do not have any signs or symptoms. The Pap test does not screen for uterine cancer. The only cancer the Pap test screens for is cervical cancer. This is why it is important to know the signs and symptoms of uterine cancer and to see a doctor if you have any of them. 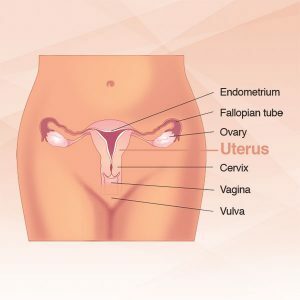 If you have symptoms or are at a higher risk for uterine cancer, your doctor may perform an endometrial biopsy or a transvaginal ultrasound. These tests can be used to help diagnose or rule out uterine cancer. Your doctor may do this test in his or her office, or may refer you to another doctor. The doctor might perform more tests if the endometrial biopsy does not provide enough information, or if symptoms continue.